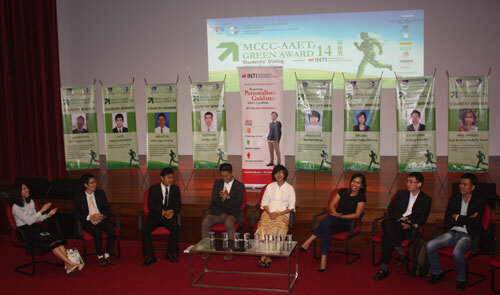 Malaysia-China Chamber of Commerce (MCCC) and ASEAN Academy of Engineering and Technology (AAET) jointly organised the 4th Annual MCCC-AAET Green Award to promote the green growth concept in the ASEAN region. The country winners from (left to right) Brunei Darussalam, Cambodia, Laos, Malaysia, Myanmar, the Philippines, Singapore and Vietnam share a light moment together. 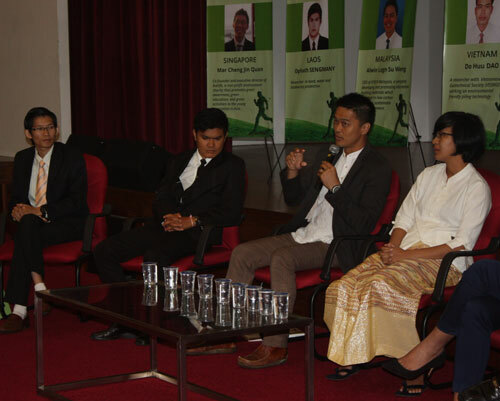 Held in conjunction with the Green Award – which recognises outstanding young technopreneurs in ASEAN countries who contribute practical solutions for environmental concerns – was a dialogue session at INTI International College Subang, the first to be convened by MCCC-AAET in collaboration with a tertiary education institution. Seven country winners of the Green Award 2014 – Queenie Chong Chin Yee, Dr Seng Bunrith, Ophath Sengmany, Alwin Long Su Weng, Wai Wai Hlaing, Engr Kristine Rodulfo Tolod, and Do Huu Dao from Brunei Darussalam, Cambodia, Laos, Malaysia, Myanmar, the Philippines and Vietnam respectively – shared their innovative ideas and experiences in promoting inclusive and sustainable socio-economic development with INTI students and faculty. Singapore’s Mark Cheng Jin Quan, who was unable to attend, was represented by Jonathan Tan. The Green Award is in line with Malaysia’s aspiration to lead in the area of promoting sustainable growth and climate action. Malaysia’s leadership as ASEAN chair and preparedness for a year of global climate action in 2015 culminating in the United Nations Climate Change Conference in Paris next year set a good example for developing nations, organisations and individuals in advocating cleaner energy for tomorrow. Alwin Long (3rd from left) from Malaysia getting a point across during a Q&A session. The Award is also in line with the programmes, activities and other initiatives introduced at INTI, where the focus is not only on preparing students to succeed academically, but also to become responsible members of the community. INTI students are provided various avenues to be actively involved in meaningful programmes, such as the Save Our Seafood (S.O.S) Project, a collaboration with WWF-Malaysia to promote awareness of sustainable seafood through fund raising and pledges to protect the environment. Many INTI students have started to make a huge impact in communities, at a very young age. For example, Ganesh Muren, a second year mechanical engineering degree student is a creator of a portable solar powered water filtration unit that is capable of providing up to 20,000 litres of clean water for consumption at a very low cost. These students represent the self-directed, motivated and independent learners that are nurtured at INTI. Through an approach that incorporates a mixture of international exposure, innovative learning and individual development, these students are able to develop in-demand 21st century skills that include critical thinking, collaboration, communication and creativity.